Rarely available mixed-use building located in sought after Lincoln Square and highly rated Waters Elementary. Less than one block from the Western brown line stop and in the center of Lincoln Square's modern and charming restaurants, shops, and artistic venues, the building has been with one family for nearly 60 years. The property is all-brick construction with seven residential and three commercial units and is located on a large 71 x 106 lot. A stunning one-of-a-kind duplex with panoramic East, North & West views of the lake & city. Located on the 51st & 52nd floors. The spacious living room has a 19'6" vaulted ceiling & the formal dining room accommodates large dinner parties. The gourmet kitchen has a large island, high-end appliances, granite countertops & flooring and a separate breakfast room. One en-suite bedroom/office is on the main level & a grand staircase leads to three en-suite bedrooms on the second level. The expansive master suite has an enormous walk-in closet with dressing area, desk area & the master bath has a steam shower & whirlpool tub. In-unit washer/dryer. The building offers a beautiful indoor pool, whirlpool, sundeck, exercise facility, saunas, 24 hour door staff, and on-site manager. Ample owner and guest parking is available. Rental valet parking $348 per month. One dog up to 30 lbs is allowed. Located at the corner of Oak St & Michigan Ave, in the heart of The Magnificent Mile. Build your extra wide (142' of frontage on kenmore) custom dream home in this incredible lincoln park location! R-4 zoning and 1.2 far allows for over 6000sf home with possibility to build close to 10,000sf with basement. Over 5000sf lot size (survey attached). Owner will sell lot for you to build your dream home or will build for you! There is an existing structure currently on the property and owner has applied for demo permit. Incredible location with awesome park directly behind home. Steps to all armitage shops/restaurants and a stone's throw to the el (but you can't hear it!) everything you need and want to build your custom forever home. The pearson! Best floor plan - 2 master suites plus 3rd room as a den. South facing large balcony, very tastefully designer, modern finishes. South facing with beautiful park & lake views from 20'balcony. Modern cabinet 1 1/4"granite. Quality design finishes & gracious closet space. Bldg offers 24 hr doorman, fitness & party room. Parking included. Available fully furnished. This 2 story Penthouse is an entertainer's dream with an open floor plan, 20' ceilings, and a private rooftop deck. Chef's kitchen with high-end appliances (Sub-Zero, Miele, and Bosch), 2" natural quartzite countertops, and a built-in wine fridge. Incredible master suite with generous bedroom with balcony, bathroom, and walk-in-closet. The additional 2 bedrooms plus an office / nursery, and 2 generous living spaces layout nicely in this 4100 square foot condo. Low assessments and 2 easily accessible 1st floor parking spaces available for $50,000 each. Just steps from River North's best dining, the Merchandise Mart, East Bank Club, Michigan Avenue retail, and the Chicago River walk. The Ritz-Carlton Residences. Stunningly remodeled and professionally decorated 3,000 sqft. Elegant 2 bedrooms with separate dining room and separate family room, and 2.5 bathrooms. Stunning DeGiulio kitchen. 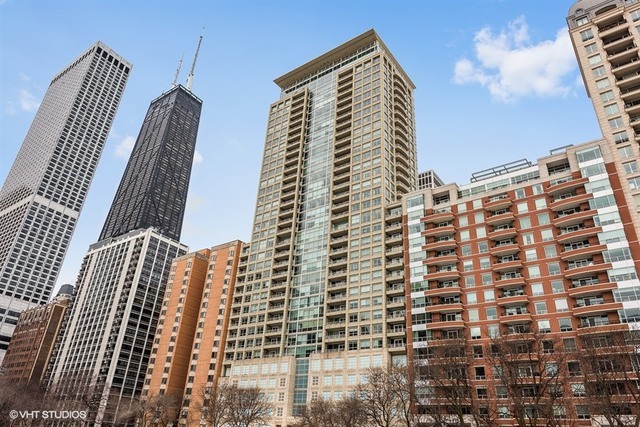 Features four exposures including Michigan Avenue and lake views. 2 outdoor spaces. Gorgeous lighting. Custom architectural details, very high ceilings, and two terraces create a classic and timeless look. Newly installed wide plank wood-flooring, Waterworks fixtures, and Wolf, Sub-Zero and Asko appliances complete the high end finishes. Enjoy private Landmark Club w/ Grand Salon, Billiards room w/ terrace, Theater, Fitness & Spa facilities. BRAND NEW full Masonry construction! This thoughtful design includes over 4700 of meticulously finished living space and high end finishes. Clean Shiplap walls, Gracious Rooms and Maximum natural light provide a feeling of home for entertainers and family alike. Gourmet kitchen includes an 8' island, 54" cabinets, luxury appliances with steam oven for healthy cooking, Pot Filler, Butler's Pantry and Built-In Desk. 5 generous bedrooms, 4+ baths, 2 laundry rooms, Master suite bath with luxury spa-like tub, over-sized resort-quality shower, heated floors, custom tile-work and separate lavatory room. Finished lower level has spacious family space and wet bar. 3rd level Lounge contains additional wet bar, south facing balcony AND 400SF Trex covered deck, prepped with gas and plumbing for fire pit and outdoor kitchen. Our over sized 25' garage hosts another Trex deck space! Burley School! Immaculate, better than new wide lot home in the Coonley School district. Detailed to perfection, this home is beautifully built on a lot & a half & offers wide gracious rm sizes. The main lvl offers expansive formal living & din rms & a good sized foyer w/huge entry closet. High end white kit w/Subzero and Wolf appls, island w/seating, & a walk-in pantry. A sep butler pan offers addtl strg, prep sink, wine frg, & blt-in desk. The kit is open to the greatroom, perfect for informal entertaining or relaxing. A 2nd butler area w/eat-in space at the rear of the home overlooks the 2 story conservatory & huge mudroom w/access to the att 3 car gar as well as the turf yard & gar roof deck. Four br's on the 2nd lvl, including the master suite w/great closets & spa bath w/dual vanities, sep tub/shwr, & Ann Sachs tiling. True ldry rm on the bdrm lvl! The LL has a huge media rm w/bar area, exercise rm, 5th br, & full bath. Walking distance to tons of great shopping & dining on Lincoln Ave! 445 Arlington is an intimate eight-unit development that offers the rare opportunity to own an exceptionally spacious single level residence with 30+' wide interiors in the heart of Chicago's coveted east Lincoln Park neighborhood. With only two units per floor, each residence offers private elevator access, expansive three+ bedroom floor plans, tremendous natural light, garage parking included and, of course, supreme finishes. Designed by Booth Hansen Architects to complement the historic row home architecture found throughout the neighborhood, the building's elegant limestone and aged brick facade is highlighted by oversized bay windows providing extraordinary light into each home. Nestled on the intimate block of Arlington Place and within steps from the lakefront, parks, zoo, schools and endless lifestyle destinations. 4E is one of two penthouse units. It offers a 600+ sq ft terrace off the living space, 1300+ sq ft exclusive roof deck and an additional bbq deck off of the kitchen.